This film was shown on British TV over the Christmas period, and a friend of mine watched it after I had mentioned the film version of this daring raid some months ago. He agreed that it was a very good film – actually with his family he had gone to the St.Nazaire area of France a year or more ago so was familiar with the location of the action. 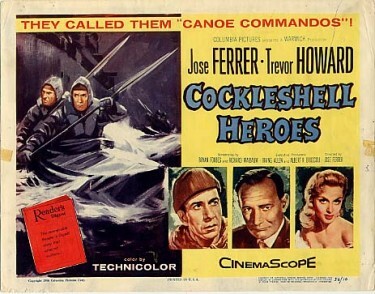 The Fifties were Jose Ferrer’s peak years as an actor and he was getting acclaim for all kinds of roles although he had never been thought of as an action hero, but in a film in which he directed himself The Cockleshell Heroes, he is outstanding in a part that someone like Clint Eastwood would have been more identified with in later years. Somehow though Jose Ferrer never had the Box Office appeal of Clint Eastwood. This was one impossible mission given to the Royal Marines. The idea is to demolish German ships in the port of Bordeaux and render the harbour useless. The problem is that Bordeaux isn’t on the coast – it is up the Gironde River. In this amphibious operation the idea is for a selected bunch of Royal Marines to row kayak like canoes up the river after having been landed by submarine on the coast under cover of darkness. So that no motors are heard on the river the plan was to use canoes. The Marines are to attach mines to the various enemy ships and blow them up and then they would escape inland with the help of the French Resistance. It all sounds very much like mission impossible – but it really did happen. The film takes us through the training and the mission - sadly most of the Marines are killed. Ferrer the director did a good job on this movie and Ferrer the actor and the rest of his cast - particularly Trevor Howard as his second in command all performed well. Above – Scenes from the film with Tevor Howard and Jose Ferrer. Trevor Howard was always good and in this one he plays someone who is tough but has a deep secret – he had failed under fire just as World War I was ending and has a black mark against him. However 25 years later he gets a second chance in another war – the Second World War. David Lodge play a young Royal Marine who goes AWOL to try to sort out problems back home with an unfaithful wife in Beatrice Campbell. 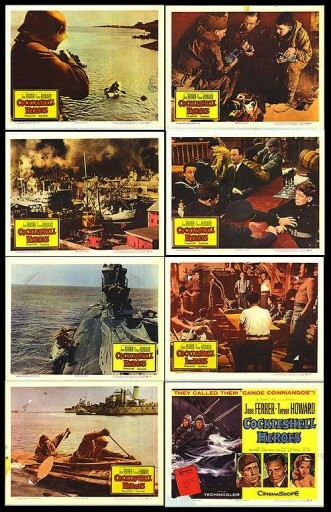 The film bears some resemblance to The Dirty Dozen from the next decade. 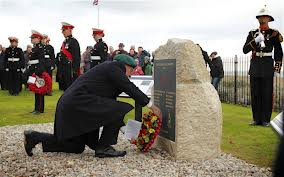 However these Royal Marines were certainly not misfits made into a fighting force- they were some of the best of that generation who went on this mission knowing that they most likely would not come back. These were not specialists, but ordinary Royal Marines who were put through a steep learning curve. Some action still from the film – above. The Associate Producer on this one was Alex Bryce who had been a film director of some note – he had worked on some of the Walt Disney films of the early fifties as Assistant Director. He was usually in charge of the exterior action shots – and there were few better at this than he was. I had the good fortune to make contact with his daughter recently and she said that he had become ill whilst working on The Cockleshell Heroes. He died in 1960. On another note I did work in the Head Office of Murco Petroleum Ltd which in the late 60s was at 65, Grosvenor Street, London W.1and at that time they employed a number of Services Station site supervisors who used to visit the office regularly - one of them I met quite frequently and it turned out that he had actually been one of the Cockleshell Heroes and had lived to tell the tale. He was a very nice person. He must have left us by now I would have thought. I wonder if there is anyone out there who worked for Murco in those offices at the time – if so maybe they could make contact through this site – I would be very pleased to hear from them. The most fitting tribute to the real life heroes of Operation Frankton came recently when a new memorial was dedicated at La Pointe de Grave, at the tip of the Gironde estuary. Above – Memorial to the Cockleshell Heroes at Poole, Dorset. 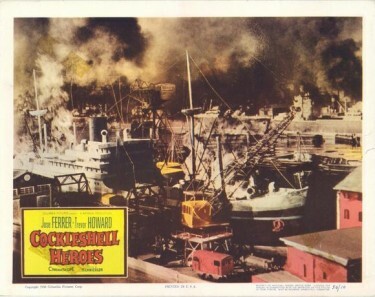 Despite the myth-making of the movie, there has been a feeling that the Cockleshell Heroes were not given adequate tribute. A memorial was created by public subscription, but, placed at the Special Boat Service base in Poole, Dorset but it cannot be viewed by the public.